Tax audit on April 15? IRS agents insulting accountants? Based on the stories we heard from members, the NSA’s Tax Practitioner Bill of Rights is sorely needed. 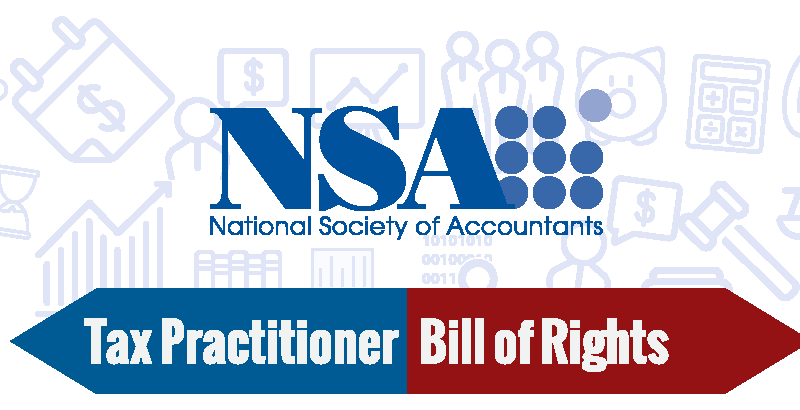 The NSA has proposed a Tax Practitioner Bill of Rights, to help practitioners dealing with problems arising from the IRS’ handling of various issues. We reached out to NSA members with a survey, and followed up to see what stories they had around the topics covered by the Bill of Rights. Here is a roundup of what we heard back. NSA’s First Vice President Brian Thompson dealt with perhaps the worst appointment time for an audit: April 15th. “During the 2015 filing season, one of my business clients brought me a notice from the IRS which indicated they were being audited,” he said. “After reviewing the notice, I saw that the appointment date for the audit was surprisingly set for April 15th.” He then called the auditor to obviously try and reschedule the audit until after the tax filing deadline. “Audits should not be allowed during tax season,” said Krieger. “Because of the hours we have to work in order to meet the IRS deadlines, I did not answer an auditor’s 10-day request, so I had to have a conference call with both of his supervisors, which took time out of my already hectic schedule to tell them why I couldn’t meet his requirements,” he said. “It seems it is OK for us to wait on the IRS, but when they ask for information, we are commanded how, when and where,” he added. It needs to be equal on both sides of the fence, he said. As for the POA, “this is the favorite response from anybody with whom you make contact with the IRS about your clients,” he said. “They tell us they do not have the form 2848, which we have proof of them receiving it, but it hasn’t been put into the system.” However, he added, the funny thing is that “sometimes they do what we ask them to as POA, but [they] send a letter to our client that they have no record of the Power of Attorney. She says she ended up filing pro se in tax court. “The audit was on fringe benefits. I have always paid the medical and dental insurance for my staff.” Anyway, audit results were a “no change” [the returns stood as filed], she said. “They could have looked up my record to see how may hundreds of returns I file by April 15. There was no way I had the time to go to an audit, much less prepare for one,” she said. This was the only audit she has had during tax season, and they were auditing two years on her own return. “The IRS could have checked to see how many returns I filed and would know I had no time but they didn’t care,” she said. Meanwhile, Bill Nemeth, EA, of Atlanta, Georgia, has had problems with communication with the IRS. “I have several clients under full Form 2848 POA,” he explains. “When they have balances due, I get a copy of the CP14 Letter showing the tax liability. I do NOT get copies of the CP14H which is the liability for the Shared Responsibility Payment.” He said he just called into the IRS PPS Line to discover that his client has a Shared Responsibility Liability for 2014 (that he knew nothing about) as well as a Shared Responsibility Liability for the recently filed 2015. Nemeth explains that his standard policy is to have an active 8821 (Information only) or 2848 (IRS Power of Attorney) on every one of his clients with the box checked to have the IRS send him a copy of all IRS correspondence. She added that she still has two clients that have not received their refunds. “One was electronically filed on April 13th, and we received the acceptance notification right away,” she said. “The other was filed the first part of April, and that client still has not seen anything on their refund either.” The other was filed the middle of March, and it took until late September before he received his refund. Wegge explained where some of the confusion came from. Her client had sold a company in ’13, and during that time he took a distribution of $95,000 from his IRA. But it turned out he had put the money back his IRA within 60 days, so Wegge agreed then it wasn’t taxable after all. “So that’s what prompted the amendment,” she said. Wegge then brought the client’s case in to the very first IRS Tax Forum in Chicago, where they had case resolutions. An agent there agreed her client was owed that money, but then she was told she couldn’t get an answer from the division to release the money, because they weren’t answering their phones. She had to go back and forth with several agents, at one point being told she wasn’t allowed to leave until they resolved it, until she could get a satisfactory answer. Finally, an agent said Wegge’s client would have his money in about two to three weeks. Nils Lenz, of Zephyrhills, Florida, says he also has worked with IRS Agents that are very rude. “I have had several Compliance Officers insult myself and well as my clients, plus they try to intimidate us also,” he said. “My agent said that ‘even his dog could be a CPA Candidate’; another asked me if I was going to practice another year, and still another one used to shake the Schedule C in front of both client and myself if there a was loss and said that it did not make sense, regardless of the fact that all of the expenses and revenue were documented. Another problem he has with them is “they tend to disallow too much, even though the correct documentation had been presented,” he said. There were two different agents with whom he had a very hard time dealing. He said he had two agents disallow everything for two different clients who are Over the Road Truckers, even as the documentation was all sorted out to make It easier for the agent; “I had gone through the trouble of sorting everything by category, and sorted chronologically,” he said. And “the other agent never stated what the issues were.” Both of these disallowed everything because of their impatience, he said. He said he took both of these Over the Road Truckers cases to appeals, and fortunately the appeals agents were both very nice and allowed everything. “Either through appeals, audit reconsideration or amendments, I was able to get the entire taxes abated,” he said. 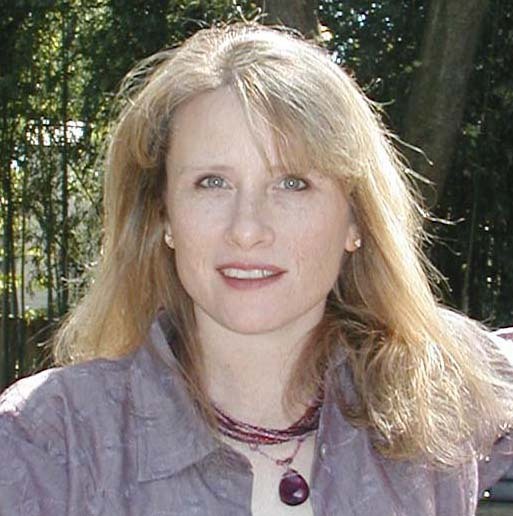 Ten months later, he said, the taxpayer receives a letter via standard first class US Mail from the agent denying spousal relief, and stating that since the taxpayer did not respond to in a timely manner to several pieces of IRS correspondence regarding this, the time to appeal and petition the tax court has elapsed. “Needless to say the taxpayer never received any correspondence, and when told of this, the agent claimed that all correspondence was sent via certified mail but could not or flatly refused to provide proof of service,” he said. “After protestation on my part,” he continues, “the agent offers to look into the case once more and ‘see what I could do if anything to help.’” Alexander says, “Since my objective is to win this case for my client, I have not cried foul thus far. However, if denied a proper hearing I will be screaming ‘bloody murder’ and demand a meeting with the supervisor,” he says. With some other types of problems, it’s with the decision itself, and would require a supervisor or appeals process. A tax audit on April 15? IRS agents insulting accountants? Based on the stories we heard back from members, the NSA’s Tax Practitioner Bill of Rights is sorely needed. 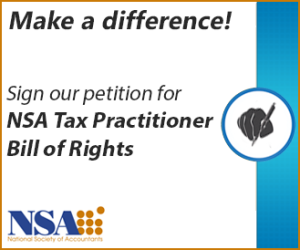 The NSA has proposed a Tax Practitioner Bill of Rights, to help practitioners dealing with problems arising from the IRS’ handling of various issues. We reached out to NSA members with a survey, and followed up to see what stories they had around the topics covered by the Bill of Rights. a. The right to have tax laws affecting the current tax year enacted no later than September 1st of that year. b. The right to have IRS forms reflecting any new laws for the current year available no later than October 1st of that year. b. The right to have taxpayer correspondence answered within 20 days. c. The right to have any collection action on the taxpayer’s account frozen while the IRS is considering a taxpayer’s timely filed response to IRS collection activity. d. The right to have one IRS representative deal with a tax issue from start to finish until the issue is resolved. e. The right to request a supervisor be involved in resolving a matter if the initiating IRS representative is unwilling or unable to resolve an issue. f. The right for practitioners with Practitioner Tax Identification Numbers (PTINs) to communicate electronically with the IRS on taxpayer matters in a secure manner. a. The right to have an IRS audit moratorium during the three weeks immediately before major tax deadlines such as March 15, April 15, September 15, October 15 of each year. b. The right to have an IRS moratorium on collection actions or collection information requests during the three weeks immediately before major tax deadlines such as March 15, April 15, September 15, October 15 of each year. c. The right to have an IRS moratorium on planned software maintenance and computer downtime periods during the three weeks immediately before major tax deadlines such as March 15, April 15, September 15, October 15 of each year.